broad-leafed whitewood trunkThe generic, Atalaya, is something of a puzzle. The genus was named by Carl Blume (1796 – 1862), a Dutch botanist who collected mainly in what is now Indonesia. The word atalaya is Spanish for a watch-tower, and there are several places in Spain and the Americas called by that name. My only suggestion (and that a wild guess) for the use of the name for this genus is the tall canopy of some species in the genus, which might suggest a watch-tower. It is also possible that Atalaya may be a local Indian name for one of the species. Multiflora is from the Latin multus, many, and flos, a flower. leaves leaf detail2014 was a strange year rainwise on Magnetic Island, with an unusual pattern of rainfall. This caused many of the trees, both natives and exotics, to have a phenomenal blossoming and fruiting, and this tree was no exception. Previously recorded (Sandercoe† ) as being found only in small numbers at Rollingstone and Maud Bays, on the north of the island, a collection of these trees, hitherto unnoticed (as far as I can ascertain) among the general vegetation on the hillside between Nelly and Geoffrey Bays, burst into copious blossom in October. The tree is usually referred to as ‘rare and endangered’, but these healthy trees, with a myriad of new seedlings propagated nearby, augur well for the regeneration of the species. flowers flower detailThe outstanding feature of the genus is the beautiful paired samaras, which persist on the tree until shaken off by the wind, when they propel themselves, rather like a helicopter, a short distance from the parent tree. samaras samara detail 1A tall shrub or small tree, glabrous except the inflorescence. Leaflets 2 to 6, ovate or oblong, very obtuse, 2 to 3 in. long or rarely more, distinctly petiolulate, coriaceous and strongly reticulate. Panicle pedunculate above the last leaves, oblong or pyramidal, minutely tomentose-pubescent. Flowers very numerous, the small scale-like bracts more conspicuous than in the other species. Flowers of A. hemiglauca. Ovary slightly pubescent. Samara 1 to 1½ in. long, including the straight or falcate wing, very divaricate, pubescent or nearly glabrous. samara detail 2 samara detail 3The tree’s habitat is the drier rainforest areas, often on rocky slopes of basalt, down the east coast as far as the Richmond River in NSW. It is also seen on sub-tropical lowland rainforest growing on alluvial soils. It can grow up to about 25 m tall with a stem diameter of 40 cm. The base of the tree is not quite cylindrical, but somewhat flanged and crooked. The bark is relatively smooth, and coloured greyish brown. Small branches are thick, marked with lenticels and showing obvious leaf scars. The compound leaves are alternate and pinnate, 7 – 24 cm long, with a stem 1.5 – 4 cm long. The leaflets are 4 – 12 cm long, 1.5 – 4 cm wide, with a stem 2 – 5 mm long, and an oblique base. There are usually 2 to 3 leaflets per compound leaf, ovate or oblong in shape, without serrations. The leaflets are relatively thick, and notched at the tip. There are around 12 pairs of relatively straight lateral leaf veins per leaflet, and these are more easily seen from the underside. The flowers are borne on panicles up to about 17 cm long, with pedicels 5 – 6 mm long. The sepals are 3 – 3.5 mm long, 2 – 5 mm wide, thin, and silky outside. There are 4 petals, obovate, about 6 mm long and 3 mm wide, glabrous or puberulous on the claw; the scales are densely hairy, and crested; the disk is unilateral. The paired winged fruit is a fawn-coloured samara, each wing 3 – 3.5 cm long, the round brown seed about 6 mm in diameter. 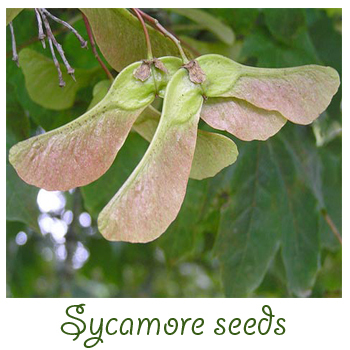 These are very reminiscent of sycamore fruits. This species differs from the other members of the genus in that it has crested scales, 4 petals and an incomplete disk, and prominently and densely nerved leaflets. Generally, the timber from trees of this genus is pale, usually yellowish brown with darker streaks, and close-grained, but tends to be soft and non-durable, and is often attacked by borers. The wood from some species was used by indigenous tribes for carving artefacts, especially those for ceremonial use.